The Adventures of Madame Maggie, or the Return of the Hound of the Baskervilles. 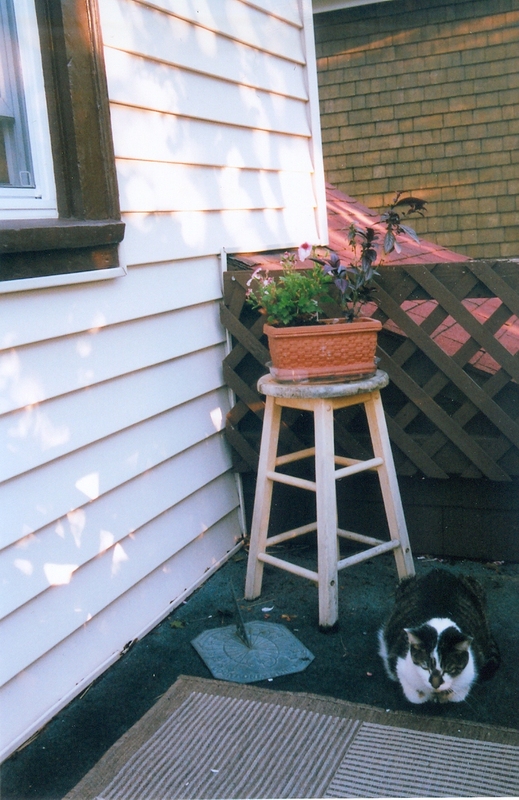 Maggie in (relatively) more courageous days, living in Madison. Authors note: I actually wrote this before Maggie began clearly showing her fatal illness, liver cancer, when she stopped eating for the last two weeks of her life. I now wonder whether her predatory lull, evidenced in the picture below, betrayed her affliction. I still find myself habitually addressing Maggie when I’m at home — and blaming her for things (she was a truly heroic all-purpose scapegoat!) — then realizing she’s gone, a heart pang every time. Milwaukee no longer brooded like a Scottish moor. Mists cleared for the city’s too-fleeting zephyrs of summer. 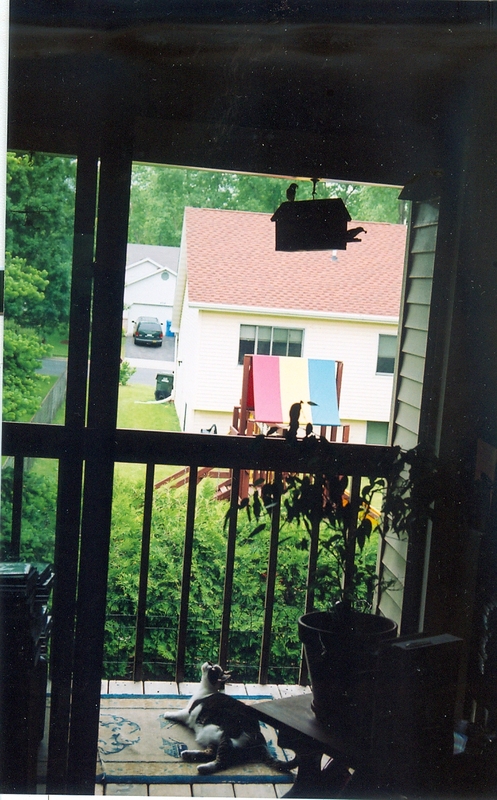 A disarmingly intoxicating aura filled the air — lilacs and guttered ephemerals. Sherlock Holmes lit his pipe and puffed, but without contentment. A question lingered. Had his intrepid feline Maggie reached advanced middle age? The photo composite below may suggest as much. This supposedly tense face-off transpired for nearly five minutes, with the bird on the TV dish gleefully taunting and mocking Holmes’ dear cat, perched six feet away, safely under his lawn chair. The entire nerve-wracking time, she twitched hardly a muscle except to peer at her master, through the window. Frankly, as a kitten, she survived horrors — being abandoned at a truck stop, and then being hounded by her next owners’ tail-twiddling toddler. Sherlock’s Magpie has also survived his divorce, a trauma for her as if she were his child. She’s a convicted ex-biter but still hopelessly addicted to Cool Whip, not a pretty picture. You, dear reader, may deduce her supplier. Better to see is her as an adorable, near-Siamese attachment to Holmes’ hip in his easy chair. So, this tale stands to extol and honor her for remarkable valor and heroism, which wears the deft guise of cowardice, to the eyes of pooh-poohers. Yet I know first-hand, Maggie can pooh-pooh with the best of them. (Her prime aliases: Poopface, Super-Duper Pooper) Clumping litter may cramp her style, at times, but we both appreciate it. “Oh yes, yes,” Watson sputtered, removing his finger from an idle orifice. Holmes worried the man suffers from what they now call ADHD. To the tale: At the slightest sound, this knowing Margaret perks her ears and — with supercomputer speed — comprehends danger, even if it be a mouse, or me loudly cracking open a can of food that she instantaneously realizes is not for her. She runs like the wind to the nearest, or best, hiding place, in that order. On a seemingly innocuous day, she reveled noisily amidst her delectable squishy-food meal — when the call for action arose. What had startled her? Holmes quickly theorized that only the Murderers of the Rue Morgue knew, and that they were afoot again. Linger over food? Not our heroine. She faced the gauntlet. 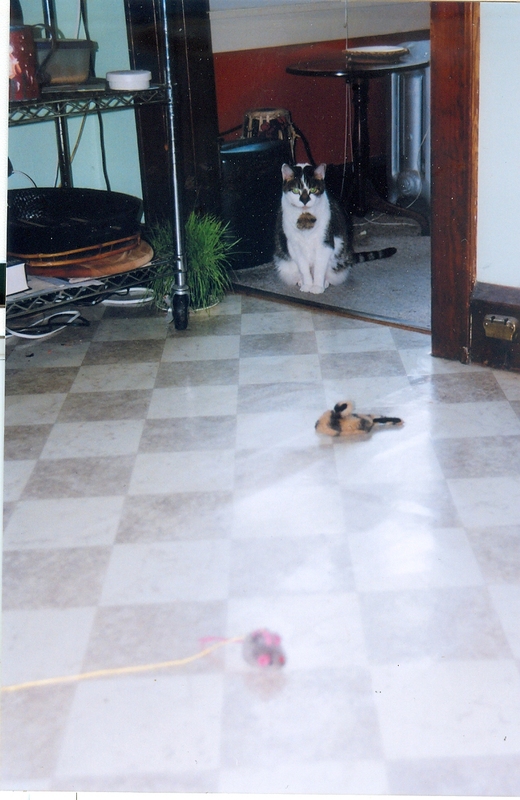 With dazzlingly athletic shake-and-bake jukes, she sidestepped Holmes’ feet, and a suddenly ominous catnip toy or two, and careened past the cat grass – which bent to her swift wind — at the doorway from kitchen to dining room. Newspapers and magazines jumped and fluttered from the parlor rug. She penetrated her safe haven – a space behind a radiator and bookshelf. Ah, she now had ample time to lick her whiskers clean of precious morsel bits, even if her still-hot path had claimed some droppings. Breathless, she peered out from between the radiator rungs, with a vigilant eye. Now that’s setting your priorities pragmatically. Safety before savoring. To quote a famous philosopher, I am not making this up. After her adventure, Maggie inspects the fur-raising gauntlet — killer cat grass, insidious toys — she had to pass through to reach safety, to Watson’s astonishment. You see, Maggie the cat educates even Holmes on Safety First. He knows that, in times of threat, that there’s plenty of room for him, too, under the dining room table, or better, deep in the nearby closet, or in her best locale of subterfuge: behind the entertainment center. This is quite brilliant strategy, because she is nearly hiding in plain view (well, OK, not really). But Holmes can sit looking right in her direction — as can far more threatening TV-watching humanoids — and detect nary a whisker of her, nor her tell-tale tail. Holmes sometimes thinks he hears her snickering back there. But he grants Maggie her smugness, because she must sacrifice at times. And during this emergency, he confessed to panic — the sheer existential dread of seeing the cat’s canniest survival instincts under seige. So Holmes unceremoniously squeezed in beside her behind the telly, and she curled her tail out of the way — with a frown and attendant complaint — and he scrunched knees to chin. Thus, they hid in that triangular cavity with reasonable discomfort, amid myriad component cords. Of course, he bravely jettisoned his pipe, to make breathing room. Then, the famous detective’s infallible nose detected a clue. He’d discovered a missing item back there. But Maggie had already taken a fancy to it — a forgotten but fragrant underthingy. Elastic is chewably animated, at least for a short duration. “Maggie is ‘good looking’ enough for me, even if for years she’s never ventured outside, beyond the balcony,” Holmes muttered. Let your mind not stray to the gutter, dear reader. T’is not a fit place for man nor beast to do anything — smashed together behind the entertainment center — but breathe and glower at each other in increasing disaffection. There they waited, once again, for the inscrutable terror to pass. Sitting back he had time for reflection. You see, this cat is our hero, especially in dire times. At least mine. Ergo, Margaret, I forgive you for no longer exhibiting brave – indeed, macho — aggression towards threatening, arrogant birds within reach. As he began to climbed out, cruel fate intervened. Suddenly somewhere, in the growing mist beyond, rose the sound of a great hound’s horrendous howl! And I’m told I need a hound! he thought, quaking. “Heart-stopping!” Watson ejaculated, gripping his chest. Maggie shuddered at the hound’s accursed wail, but she bravely recovered. Hers is the last word. The tale’s told. Almost. “Hark! To the hideaways!” Holmes boldly commanded. *Perpendicular hairs (and run from) Dogs. Dedicated to the late Maggie Lynch and Sharon J. Lynch, Sherlock Holmes aficionado extraordinaire. 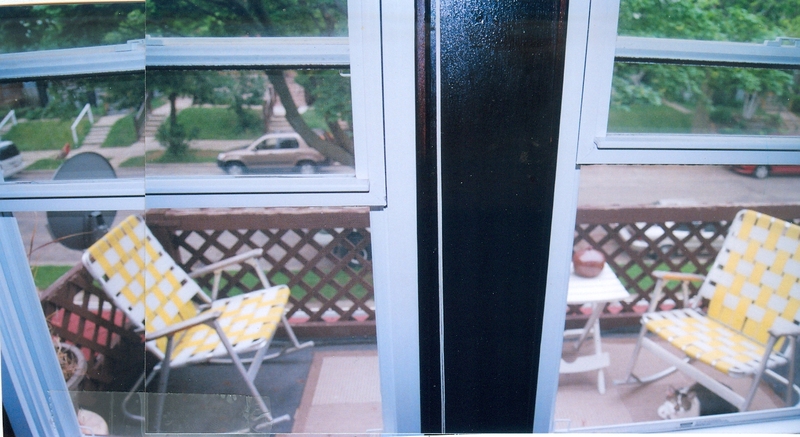 Maggie’s final visit to the balcony, on her last day, August 16, 2013. R.I.P. 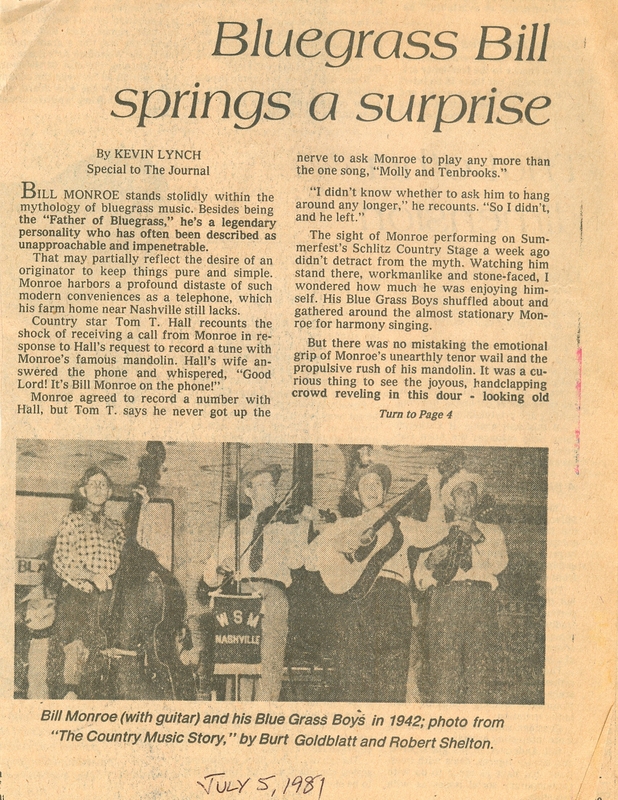 I interviewed Bill Monroe — born 98 years ago today — between his sets at Summerfest in 1981 for The Milwaukee Journal (published July, 5, 1981). He is credited for inventing bluegrass in 1939 when his Bluegrass Boys auditioned at the Grand Old Opry and caused a high, lonesome stir that has never quite died down, rather coming and going through American culture like the wandering winds of the Appalachian Mountains. The soundtrack to a popular Coen Brothers film helped spur a bluegrass and roots music movement. Courtesy www.last.film. Today the British popularizers Mumford & Sons are admittedly influenced by the American groups The Avett Brothers and Old Crow Medicine Show, whose instrumentation and vocal harmonies draw deeply on bluegrass. When I met Monroe, he maintained a fine Southern decorum but vibrant self-awareness of his role in history, without directly proclaiming it. The article helps to backdrop the impulses of today’s roots music. It was a close to the dawn of the mid-80s-to-early 90s roots music breakout but it speaks well of Monroe’s sense of cultural truth and inevitability at age 70. Monroe was diagnosed with cancer in 1981, the year I interviewed him. I didn’t know it at the time and now wonder how it might have affected him during the interview. Feeling more vulnerable or more mortal? More reflective, accepting? I think the interview is all the more extraordinary because Monroe was legendarily resistant to interviews, even for annotators of his own albums. He had once threatened to break his mandolin over the head of a writer if he ever mentioned Monroe’s name in a book. Me, I guess I just got lucky, and because he’s now dead, his threats are history. But Bill was lucky, too. After radiation treatment he survived for years. On April 7, 1990, Monroe performed for Farm Aid IV in Indianapolis, Indiana along with Willie Nelson, John Mellencamp, Neil Young and with many other artists. He died September 9, 1996 — after suffering a stroke in April of that year — just short of his 85th birthday, which was September 11, 1911. Monroe felt his place in history had been abused and distorted too many times. Now I wonder if perhaps the cancer and his the sense of mortality led him to speak his mind, to set the record straight. 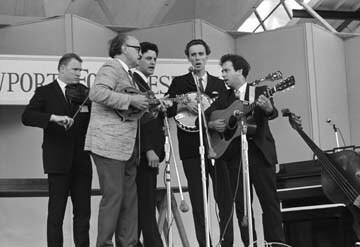 Bill Monroe (second from left) at the 1968 Newport Folk Festival. Newport’s seaside winds may have blown off his trademark Stetson. Courtesy Robert Corwin/PhotoArts. The following interview story, slightly edited by me, was headlined “Bluegrass Bill Springs A Surprise,” In the story, he sprung a surprise on singer Tom T. Hall, but the surprise is also that — despite his famously ornery reputation — he opens up the way he does, and shows he cares about the music and about communicating it to people of all ages. 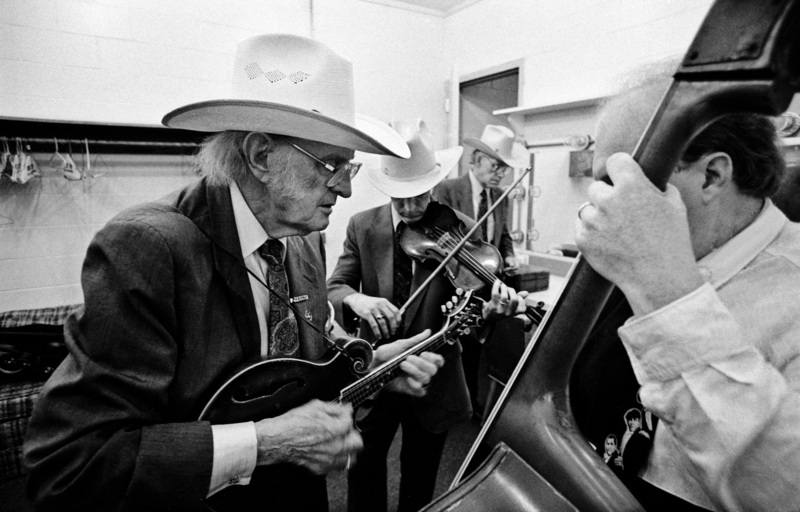 Bill Monroe stands centrally within the mythology of bluegrass music. Besides being “The Father of Bluegrass;’ he’s a legendary personality whose famously inpenetrable reticence may have partially reflected the desire of an originator to keep things pure and simple. Monroe harbors a profound distaste of such modern conveniences as a telephone, which his farm home near Nashville still lacks. But the sight of Monroe performing on the Summerfest Schlitz Country stage a week ago didn’t detract from the myth. Watching him stand there, workmanlike and stone-faced, I wondered how much he was enjoying himself. His Bluegrass Boys shuffled about and gathered around the almost stationary Monroe for harmony singing. But there was no mistaking emotional grip of Monroe’s unearthly tenor wail and the propulsive rush of his mandolin. It was a curious thing to see the joyous, hand-clapping crowd reveling in this dour-looking old man. But the power of music works in mysterious ways. I prudently eschewed such a newfangled contraption as a tape recorder in preparing for a backstage interview. “He’s an ornery old fella,” Schlitz stage manager Bill Gorman told me, with an assuring smile. He introduced us and, with a trace of trepidation, I shook Monroe’s hand. “Oh, please have a seat,” he said. I sat down. The white-Stetsoned Monroe towered over me, still chomping silently on the cold cuts. Clearly, he had no intention of taking a seat. “Just got into town on your bus?” I asked, clutching at the first question that came to mind. Yes sir. I smiled inside. The grand old man of bluegrass standing in a suit and neat dark tie proffering the term” sir” to a blue-jeaned, tennis-shoed reporter no older than his grandson. What was in your mind when you came up with the idea of bluegrass, I asked him. His answer reflected his notoriously reclusive nature. “Stonewall Jackson plays Bluegrass,” I thought, and tenuously pressed him a bit further. Do you think your famous high, lonesome sound came out of your life situation at the time? “There is blues in the music too, that touches a lot of feelings,” Monroe said. He looked away and continued. “I grew up on an old farm in Kentucky and there wasn’t nobody to visit with except the old folks and a few critters. He stopped, as if suddenly realizing that he was tipping a hand he normally holds close to his vest. I asked him whether he felt he plays for a particular audience or for anyone who’ll listen. 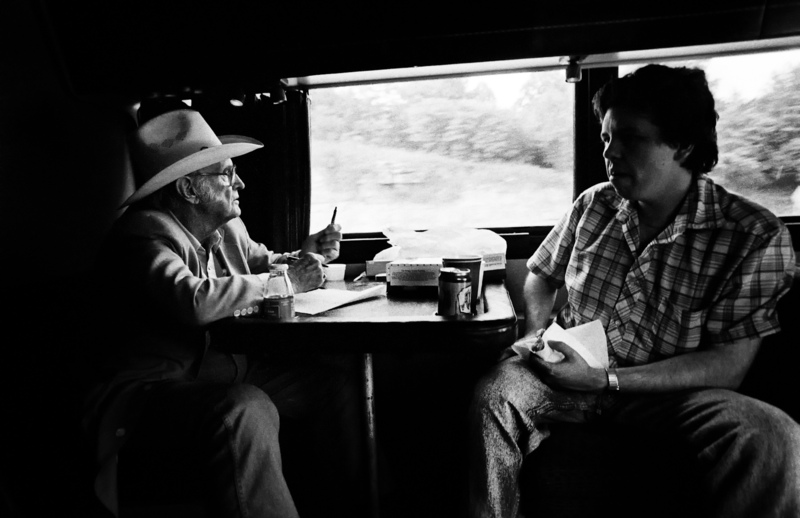 Bill Monroe (left) on a tour train with Dana Cupp, the last banjo player he ever recruited for The Bluegrass Boys. www. genelowinger.com. Photo courtesy of Gene Lowinger. Monroe spoke diplomatically about the rise and dissemination of bluegrass music. He indicated a clear preference for the pure form as he created it, but voiced no ill will towards popularizers. I asked him how a country man dealt with nationwide touring and the ways of city people. Did he think the rise in popularity of bluegrass and country music indicates any new attitude in Americans about the way they want the world to be? “Well, the music has changed an awful lot since ‘39 and the world has changed a lot too,” he said. A white-hatted Blue Grass Boy stuck his head in the doorway, beckoning Monroe to come along for the last set. Bill appeared to want to think about the question a bit longer, but the door was open now, and the buzz of the crowd seemed to draw him like a magnet. The manner quickly turned from reflective to curtly cordial. I took the little pitch in stride because I felt that he did care what I thought. He met my eyes once more with a nod, and he struck me as being a shy man far more than a cold, standoffish one. 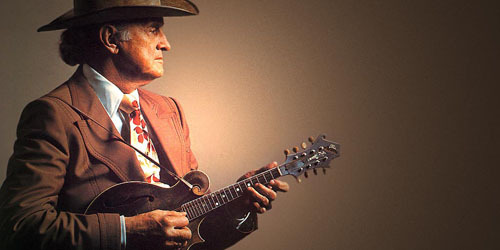 Heading to the stage, Monroe tucked his glasses in a pocket and his shyness inside the role of “The Father of Bluegrass.” With a strong grip on his mandolin, he can sing all he wants. Here’s Monroe in an extraordinary solo performance of the classic “Wayfaring Stranger in 1989, eight years after I interviewed him. Courtesy vintage18lover. 1.By 2000 Monroe was dead, but the T-Bone Burnett-produced soundtrack to O Brother, Where Art Thou? 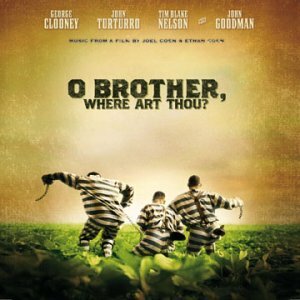 includes, among others, Ralph Stanley, Alison Krauss, Gillian Welch, Emmylou Harris, The Stanley Brothers, John Hartford, James Carter & the Prisoners, The Fairfield Four, Norman Blake and singer-guitarist Dan Tyminski, who dubbed for actor George Clooney, who plays an escaped prisoner and a member of the fictional Soggy Bottom Boys. 2. Thanks to Milwaukee Journal editors Dominique Noth and Steve Byers, who sent me a very laudatory note after the article was published. 3. Du Noyer, Paul (2003). The Illustrated Encyclopedia of Music (1st ed.). Fulham, London: Flame Tree Publishing. p. 196. ISBN 1-904041-96-5. via Wikipedia. 4. Master of Bluegrass is available on the Bill Monroe box set My Last Days on Earth 1981-1994 on Bear Family Records. These suggest how photographer Curtis, a native of Whitewater, dealt with virtually all aspects of Native American life, not just the Indians we’ve heard of who fought heroic and ultimately doomed battles for their land and tribe. The Indian’s passion for their land was deep and spititual. Black Elk prfoundly express the passion’s wisdom by declaring “The Holyland is everywhere.” The “holyland” begat the verdant and living nature and feed the people and the women and children were the brightest blossoms of the Nature-to-humanity continuum. 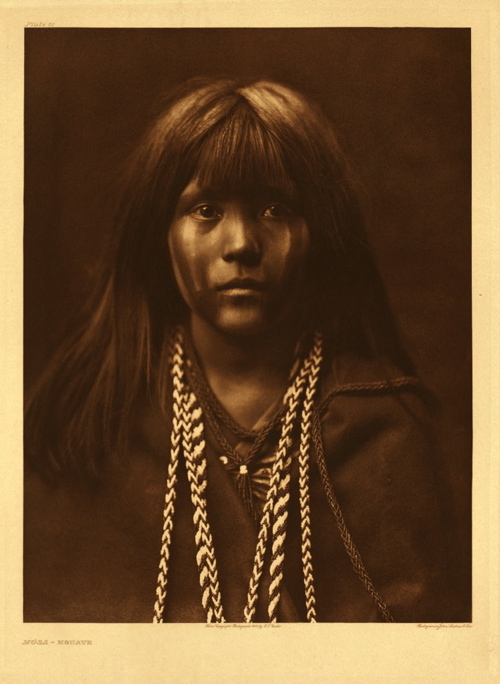 Mosa (above) captures the beauty and budding mystery of a Mojave girl fully embracing her native culture. Culture makes us want to understand her choices and values at a time when she is still forming and articulating them for herself. And what lies within her somber aura (disconcerting to see in one so young)? Does the sadness contain age and wisdom beyond her years, gained in hard ways? The stunning image of is also significant because it captivated J.P. Morgan, then perhaps the world’s richest man. Morgan had refused financing of Curtis’ anthropological documentation project The North American Indian — until he saw this photo of lovely Mosa. 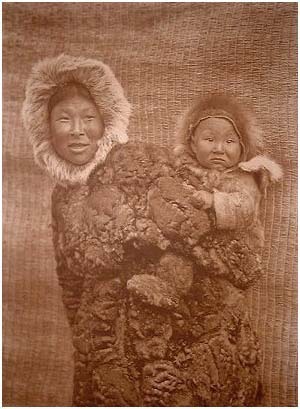 “Woman and Child” 1927 by Edward Curtis. Courtesy The Dubuque Museum of Art. 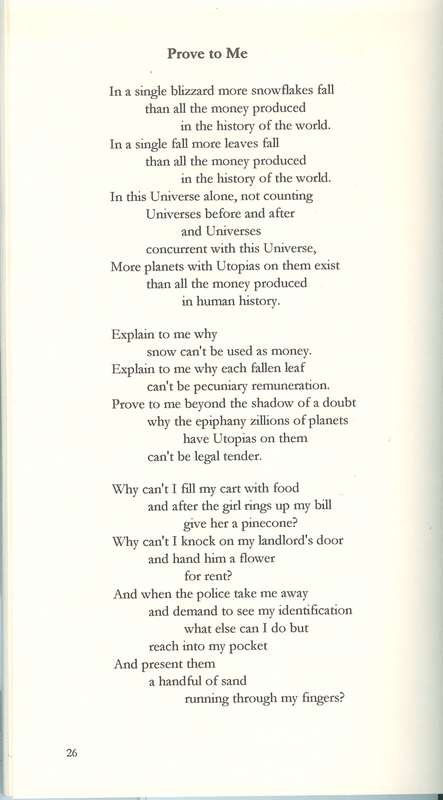 Remember Antler’s celebrated and acerbic protest poem “Factory”? He no longer rails, but his middle age still emits an eagle’s cry for vivid dreams and hope. The former Milwaukee poet laureate’s often-stunning statistical research skirls into billowing “what ifs.” Then, “The Come Cries of the Unborn Come” brilliantly marries birth to last days, and life’s continuum — disarming tired left-right dualisms. Be prepared for unabashed, hilarious erotica. But please don’t grouse over such outrageous love of life — Whitman’s sacred embrace reborn. There are few living poets who write in a straight-shooting vernacular style that can gently grab hold of your mind’s eye and not let go, until he exhales his last beautiful or harsh truth, or until he’s hoisted you onto a high, granite vista to see and feel possibility, as if it were just within reach. By the way, If you have a chance, go to hear Antler read his poetry. He declaims with exuberant verve, a sly wit, and a fine feel for the nuances of irony and tenderness in his verse. 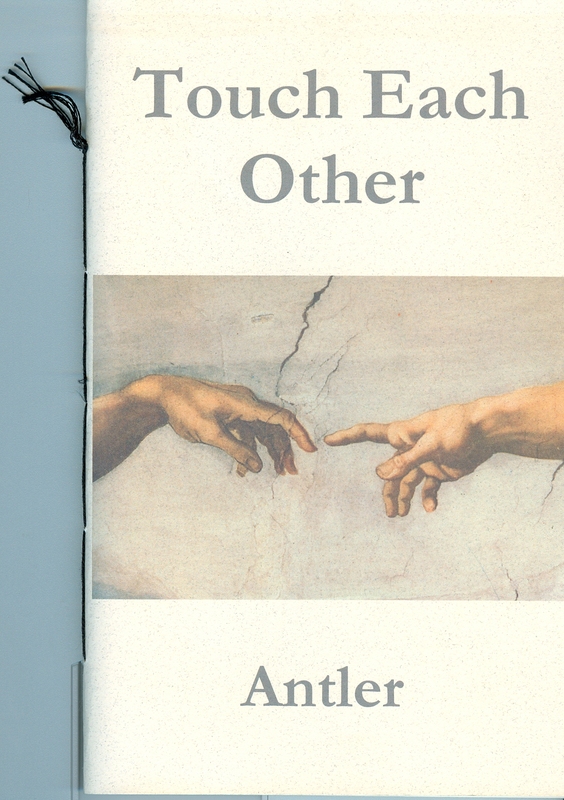 Antler has been acclaimed by such major and kindred poets as Allen Ginsburg, Gary Synder and Lawrence Ferlinghetti, who published Factory in the renowned City Lights series. 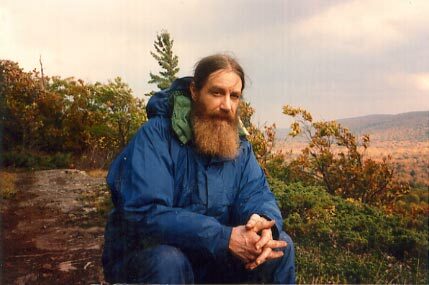 In 1985, Antler won the Walt Whitman Award, given annually to an author “whose contribution best reveals the continuing presence of Walt Whitman in American poetry.” He won the 1987 Witter Bynner Prize awarded annually “to an outstanding younger poet” by the American Academy and Institute of Arts and Letters in New York City. Antler has been invited to read at Walt Whitman’s birthplace on Long Island in 2014. September is National Literacy Month. I wanted to relate that, according to the National Center for Family Literacy, more than 30 million Americans have reading skills below basic literacy levels. I also wanted to share my favorite image of literacy. 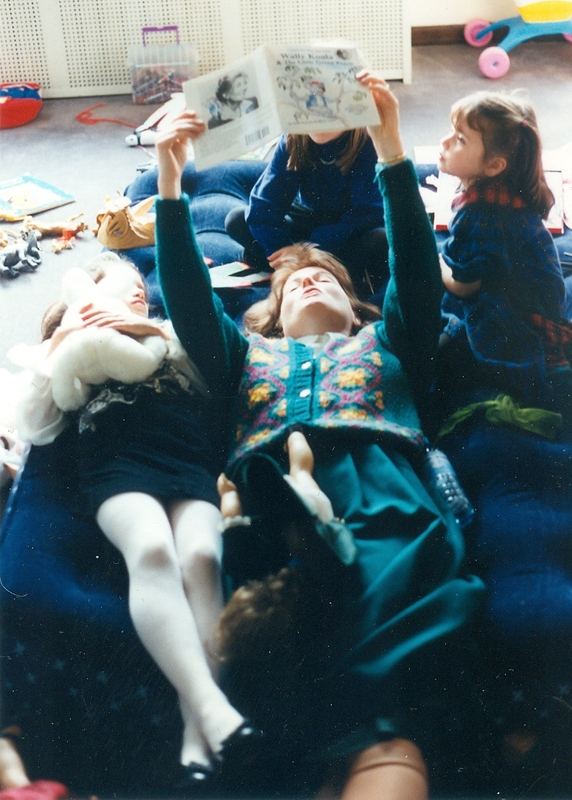 This photo depicts Lynn Bartoszek, at the time a dedicated ESL teacher in Madison, reading for her three nieces, Katherine, Hillary and Sonya, at a holiday family gathering. All children should have an aunt, or a reading mentor, like Lynn.